The PVM-740 is a new type of 7.4-inch high-resolution (960 x 540 pixel) portable monitor which incorporates an Organic Light-Emitting Diode (OLED) display panel with Sony’s unique Super Top EmissionTM technology. Thanks to the nature of the OLED display panel and Sony’s Super Top EmissionTM technology, the PVM-740 offers outstanding high-contrast images. Incorporating a 10-bit panel driver, Sony’s Super Top EmissionTM OLED display panel creates lifelike and smoother-than-ever gradation from dark to bright portions of a scene. Also, an excellent blur-free quick response to fast motion benefits a variety of applications and scenes, e.g., sports broadcasting, monitoring of camera panning, and text scrolling. In addition to the high-purity deep colour reproduction characteristics inherent in Sony’s Super Top EmissionTM OLED display panel, two other elements – Sony’s 10-bit panel driver and ChromaTRU technologies – work effectively to emulate the colours and gammas of CRT monitors, and to support broadcast standards (SMPTE-C, EBU, and ITU-R BT.709). Incorporating a compact, lightweight, and robust aluminium die-cast body, the PVM-740 suits many different indoor and outdoor applications. The PVM-740 is equipped with standard interface connectors – a composite video, 3G/HD/SD-SDI, and HDMI – which accept a variety of video signal formats from PAL/NTSC up to 1080/50p and 60p. This PVM-740 is ideal for a wide range of professional monitoring applications including use in an editing studio, outside broadcast, acquisition, field production, engineering and even research and development. PVM-740 accepts almost any SD or HD video format, both analogue and digital. To provide mobility, the PVM-740 incorporates various video interfaces as standard, including composite, SDI interface for SD-SDI, HD-SDI, 3G-SDI, and HDMI interface. With the 3G-SDI interface, PVM-740 accepts 1080/50p and 1080/60p formats, which is compliant with the SMPTE 425 standard, transmitting up to 4:2:2/10-bit 1080/60p and 1080/50p video data using one SDI cable. When an upgrade to these 1080/p systems is required, this single-link 3G-SDI* system is ideal, future-proof solution. * The SD-SDI, HD-SDI and 3G SDI inputs share the same BNC connector, which offers automatic signal detection. The PVM-740 monitor has a 3G-SDI input capability as standard. 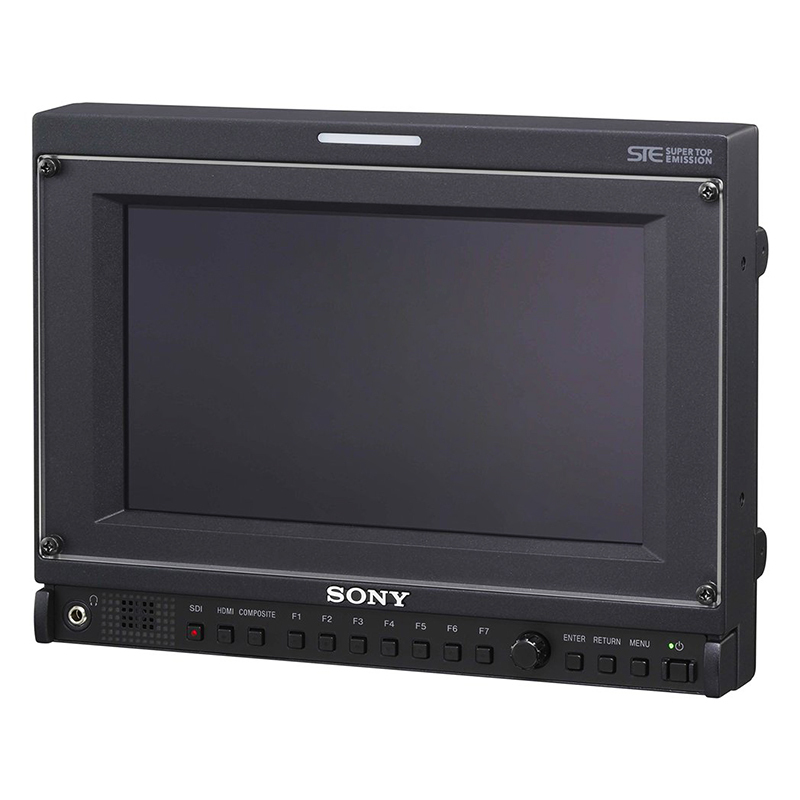 On Sony’s monitors, the 3G-SDI interface is compliant with the SMPTE 425 standard, transmitting up to 4:2:2/10-bit 1080/60P video data using one SDI cable. This single-link system is known as a SD-SDI or HD-SDI system, but it can also handle both Dual-Link HD-SDI and 3G-SDI video data with the use of Sony’s 3G-SDI interface. This 3G-SDI interface enables the PVM-740 monitor to accept 50P and 60P* video data. Where an upgrade to a Dual-Link HD-SDI system is necessary, this single-link 3G-SDI system is also the ideal alternative. * 50P/60P images are reproduced without the delay caused by the I/P-conversion process. HDMI connectivity can expand user convenience and applications. For example, the PVM-740 monitor can connect with a professional video system such as an XDCAM, XDCAM-EX, NXCAM, or HDV system. Furthermore, consumer video products like a Blu-ray or digital camera can also be connected, which is ideal for video authoring or photo image previews. The PVM-740 monitor uses precisely manufactured RGB colour filters, allowing the reproduction of colours with stunning depth and saturation to create highly natural images. The PVM-740 monitor provides high-brightness, high-contrast images and outstanding deep blacks by utilizing Sony’s unique Super Top EmissionTM OLED technology. The PVM-740 monitor wide viewing angle both horizontally and vertically, with virtually no reduction in picture contrast, colour saturation and hue shift. This allows precise images to be clearly viewed from various positions and angles – a critical requirement in professional video monitoring. The PVM-740 monitor uses robust AR-coated protection layers, which minimize the chance of the panel being scratched during transportation – an extremely important criteria for use in the field or in any mobile application. The AR coating additionally has two unique characteristics: it provides a high transmission rate of the internal light source to keep the picture as bright as possible, and it keeps reflection from ambient light to a minimum. As a result, when used in bright lighting conditions, high contrast is still maintained even in dark areas of the picture. Every PVM-740 monitor is precisely colour-calibrated at the factory, providing characteristics consistent with those of CRT monitors so that the R, G, B colour coordinates are virtually the same as those of a CRT monitor. As Sony’s Super Top EmissionTM OLED display panel itself reproduces high-purity colours and in combination with the 10-bit panel driver and Sony’s ChromaTRU technology, the PVM-740 monitor can emulate the colours and gammas of CRT monitors, and achieves broadcast standards (SMPTE-C, EBU, and ITU-R BT.709). PVM-740 uses a motion-adaptive I/P-conversion process to achieve conversion results that are optimized to the picture content – whether the image is static or dynamic. Highly accurate I/P conversion of both HD and SD inputs are provided regardless of signal resolution. The PVM-740 can control and increase the aperture level of a video signal, and display images on the screen with sharpened edges to help camera focus operation. This camera focus function can even be enhanced when combined with native scan mode. An input signal’s waveform with a 2-channel audio level meter can be displayed on screen. When an SDI interface is connected, the embedded audio level can be displayed on screen with an 8-channel audio level meter. *The PVM-740 supports the on-screen audio level meter when it receives an SDI-embedded audio signal. The PVM-740 monitor has a feature to flip a picture without frame delay, horizontally, vertically, or horizontally and vertically. This feature is useful and beneficial – for example, when using a 3D image acquisition system with a 3D rig camera and a pair of 2D monitors, the monitors can be hooked up to the camera systems directly with no need for an external signal convertor. This allows for much simpler system integration and greater cost efficiency. The PVM-740 monitor can display various area markers, including a centre marker and aspect markers. The brightness of these markers can be selected from three different levels: white, grey, and dark grey. Users can also select either a black or grey matte to fill the outer area of the aspect markers. These flexible marker controls, together with the choice of many different aspect markers, make the PVM-740 monitor extremely convenient display device for a variety of shooting scenarios. The PVM-740 incorporates a new control-function design. By assigning monitor functions* to each of its seven function buttons respectively, users can customize the PVM-740 for a specific application or usage such as field and studio use. Colour temperatures of 9300k, 6500k, or a user preset value can be selected. Scan size can be selected between Normal scan, 5% over scan, and Native scan modes. The aspect ratio can be switched between 16:9 and 4:3 according to the input signal. The Native Scan function is a unique display mode that reproduces images without changing the input signal’s pixel count – mapping the pixel of the input signal on the panel pixel-to-pixel. The PVM-740 comes equipped with a tally lamp that can be lit via a parallel remote connector. The status of the signal displayed on the monitor can be identified by the tally colour – red, green, or amber. The PVM-740 monitor can be controlled remotely via a parallel and serial remote connector. There are 27 functions in the parallel remote menu (such as the ability to switch input signals), of which eight can be allocated to the connector. The serial remote controls are supported via the Ethernet command. Up to 32 monitors and up to four control units can be connected via Ethernet connection and controlled remotely on the network. The PVM-740 is equipped with a headphone jack and a monaural speaker (0.5 W), which enable the user to monitor audio. When no input signal is received for over a minute, the monitor goes into power-saving mode and consumes minimal power. This function prevents unnecessary electrical consumption. This convenient function enables users to stop the built-in cooling fan, achieving monitor operation without any fan rotation noise. Silent mode is ideal when noises must be avoided. The key-inhibit function helps prevent inadvertent operation from the control panel. The PVM-740 is 4U high and half-rack wide. Using the optional MB-531 Mounting Bracket with a 10-degree-forward and 10-degree-backward nonstop-tilt capability, two units can be installed side by side in a 19-inch EIA standard rack. The PVM-740 monitor has 3/8-inch and 1/4-inch screw holes on the bottom. These allow the PVM-740 monitor to be installed in a camera system, for example, by mounting it on a camera pedestal. The PVM-740 can also control and increase the aperture level of a video signal to help camera focus operation. The PVM-740 is a strategic choice for use in ENG and EFP field operations. Its picture contrast, compared to that of a CRT display, is less affected by ambient light, allowing clear images to be viewed even in strong sunlight. For further protection, the optional VF-510 ENG Kit provides a viewing hood, carrying handle, and connector protector.